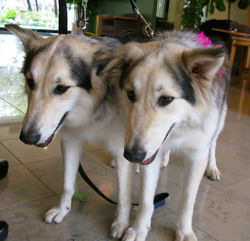 A dog and its clone standing next to each other. Animal cloning is the process of artificially creating an organism that is genetically identical to a parent animal, and then developing the clone inside a surrogate mother. There are two main techniques to this still very experimental process. Although there have been several successful clones, the success rate is very low as aspects vary for each animal. The goal of artificial animal cloning is to create an organism that is genetically identical to the parent organism. Currently, all successful cloning examples have occurred through the process of somatic cell nuclear transfer. This technique includes the inserting of the nuclear DNA of a somatic cell (any cell other than reproductive cell) in an unfertilized egg that has had its nucleus removed. The egg cell, with the new DNA inserted, divides, forming an embryo that is genetically identical to the donor of the somatic cell. Once the egg develops into an embryo, it is then placed in a surrogate mother to further develop and eventually be born. There are two methods of somatic cell nuclear transfer (SCNT): the Roslin technique, and the Honolulu technique. In the Roslin technique of somatic cell nuclear transfer, a tissue culture must be made of the somatic cells of the organism being cloned. The culture is then deprived of nutrients, causing it to enter a stage of dormancy. Once the nucleus of the egg cell is removed, a nutrient deprived somatic cell is placed next to the egg. As an electrical current is applied, the two cells join together, causing the egg to take the nucleus of the somatic cell and therefore form an embryo. The embryo is then placed into a surrogate mother to develop. This method was used in the first successful animal cloning process (see below). This technique was created by researchers and scientists at the Roslin Institute. The Honolulu technique, discovered by Ryuzo Yanagimachi, Toni Perry, and Teruhiko Wakayama from the University of Hawaii, leaves out the development of a tissue culture of somatic cells. Instead, they prepared their enucleated (cell that has had its nucleas removed) egg cell, the nucleus of the donor somatic cell is extracted and then directly injected into the egg cell. The egg cell is then placed in a chemical solution to begin it's growth. The embryo is then placed into the surrogate mother. Since artificial animal cloning was first successfully conducted in 1996 many organisms have been successfully cloned. Other animals that have been successfully cloned include: a mouse (1998), guar (2000), pig (2000), mouflon sheep (2001), cat (2002), cow (2002), goat (2002), rabbit (2002), deer (2003), horse (2003), mule (2003), rat (2003), wildcat (2003), dog (2005), bangteng (2005), ferret (2006), swamp buffalo (2006), and gray wolf (2007). The most notable and widely known example of animal cloning is Dolly the sheep. Dolly was cloned in 1996 by Ian Wilmut and Kieth Campbell, two scientists at the Roslin Institute using the Roslin technique. Despite the fact that Dolly's surrogate mother was a black-faced sheep, Dolly had a white face because the sheep from which she was cloned had a white face. The method used to clone Dolly yields a very low percentage of success. In fact, 277 cell fusion attempts yielded only 29 embryos. These embryos were distributed between 13 surrogate mothers and only one fully developed into a lamb. Dolly's success led to many scientific discoveries. For example, Dolly gave birth to several offspring, proving that a cloned organism is capable of sexual reproduction. Dolly lived from July 5, 1996 to February 14,2003, and was euthanized because of her arthritis and lung cancer. Geneticists have looked toward animal cloning as a possible solution to repopulating endangered or extinct species. For example, some believe that it could be possible to clone a wooly mammoth through somatic cell nuclear transfer with an elephant egg. Despite the fact that many animals have been artificially cloned, there are many difficulties in the process. As previously stated, the Roslin Technique of somatic cell nuclear transfer (SCNT) yields a very low percentage of living offspring compared to the amount of cells fused. In the example of Dolly, only one embryo out of 277 formed into a lamb. The first dog ever cloned took 1,095 attempts before an embryo developed into a puppy. Scientists have found that every animal requires different care in the process of cloning. Several problems that lead to the common failure of SCNT include ovulation and the period of egg maturity. Different animals have different ovulation cycles requiring the SCNT to take place in a very limited and specific time period. In the case of dogs, an egg will remain mature for only several hours after ovulation, so the egg must be extracted, nucleus removed, fused with the somatic cell and placed into a surrogate mother within this short time. Currently, scientists are unable to clone birds through SCNT because of the fact that they lay eggs externally. If the egg was cut to withdraw and replace the nuclear contents, the bird would not survive and develop because the egg contains all the necessary nutrients and the shell provides protection. Cutting the shell would compromise the egg. Animal cloning has many benefits and drawbacks, and it is certainly not a perfected science. 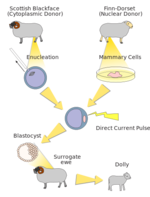 The topic of animal cloning brings up many debates. People have noted many pros and cons of animal cloning. Because cloning produces genetically identical organisms, it could be used in industries to create duplicates of the organisms that produce the highest quality or quantity of a product. With genetically identical subjects, scientists could test much more accurately. These test animals would serve as controls in an experiment. Some have looked to cloning as a possibility for harvesting organs for use in other animals and potentially even humans. As stated previously, one hope for animal cloning is to preserve endangered species and possibly restore extinct species such as the wooly mammoth. The process of cloning is highly expensive, requiring special equipment, experienced scientists, numerous tests, and time. As stated twice previously, the success rate of animal cloning varies on the species, but generally it is extremely low. Many people question the morality of animal cloning. Some believe that humans are attempting to play the role of God by creating these animals. Some argue that ethically, cloning animals is no different than selective breeding. This video discusses many aspects of animal cloning. ↑ 1.0 1.1 1.2 1.3 1.4 Bailey, Regina. Cloning Techniques About Education. Web. Accessed 13 April 2015. 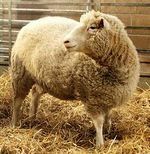 ↑ 2.0 2.1 Cloning Using Stem Cells: Types, Techniques and Dolly Sheep Biotech Articles. Web. Published 23 May 2010. Author unknown. ↑ Three Ways to Clone Mammals Human Cloning Foundation. Web. Accessed 20 April 2015. Author Unknown. ↑ Chapter II: Technology Overview: Somatic Cell Nuclear Transfer and Other Assisted Reproductive Technologies U.S. Food and Drug Administration. Web. Updated 14 July 2014. Author Unknown. ↑ Animal Cloning Buzzle. Web. Accessed 20 April 2015. Author Unknown. ↑ 6.0 6.1 6.2 6.3 Cloning Dolly the sheep AnimalResearch.info. Web. Accessed 20 April 2015. Author Unknown. ↑ Cloned animals RSPCA. Web. Accessed 20 April 2015. Author Unknown. ↑ 8.0 8.1 8.2 8.3 Conger, Cristen. Why are some animals harder to clone than others? How Stuff Works. Web. Accessed 28 April 2015. ↑ 9.0 9.1 9.2 9.3 9.4 9.5 9.6 Pros and Cons of Animal Cloning HealthResearchFunding.org. Web. Published 25 February 2014. Author Unknown. This page was last modified on 3 August 2015, at 09:31.